Site investigation services are offered by many companies, but what really makes a difference is the way geotechnical data is analysed and interpreted. FSG’s experienced team of geotechnical engineers and engineering geologists are focused on developing ground models which identify pertinent geotechnical features allowing us to assist our clients making informed decisions and mitigating construction risks. 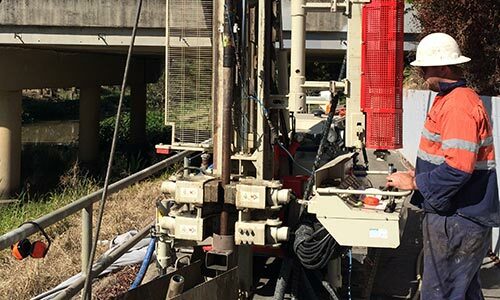 We also offer a number of specialist geotechnical testing services which allow us to better characterise near surface soil strength/stiffness and optimise geotechnical design. Australian Standards (AS 1726-2017), Geotechnical Site Investigations. New Zealand Geotechnical Society 2005 Field Description of Soil and Rock – Guideline for the Field Classification of Soil and Rock for Engineering Purposes. Look, B. (2014). Handbook of Geotechnical Investigation and Design Tables. 2nd Edition, United Kingdom: Taylor and Francis Publishers. Various British (BS) and American (ASTM) standards are also referenced as appropriate where Australian Standard AS 1726 or AS 1289 lacks sufficient technical detail or does not have an equivalent test. By going beyond normal industry practice, FSG offer our clients a more detailed site characterisation, which can be used to better manage construction risks and optimise geotechnical design. FSG’s approach of outsourcing routine laboratory testing allows us to choose labs of the highest quality and most up to date methods and equipment in the industry. By outsourcing routine testing, FSG is able to focus on specialist testing methods which provide our clients with more advanced field testing methods which can be used to optimise design. The Light Falling Weight Deflectometer (LFWD) can be used for subgrade assessment and quality control. 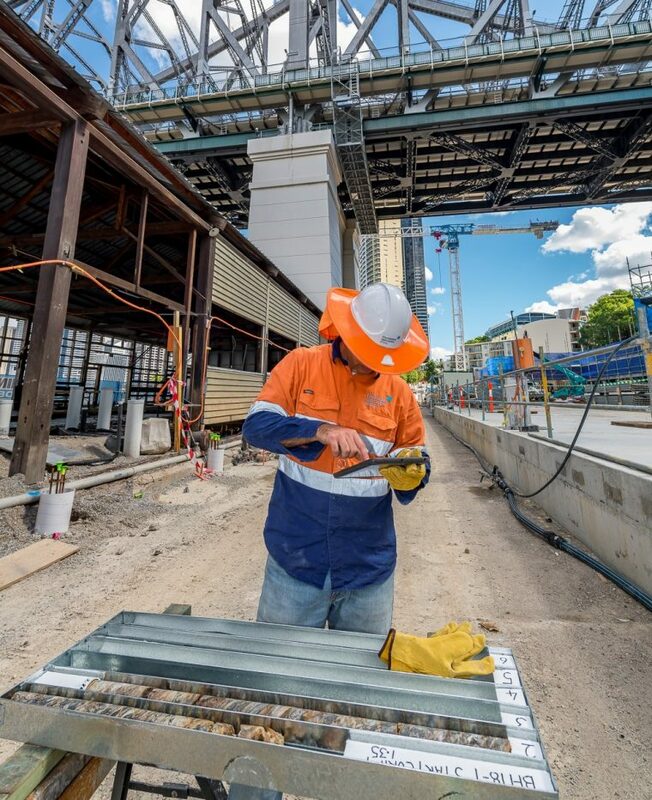 FSG’s David Lacey has introduced the use of LFWD technology to many Queensland projects. David’s PhD thesis is based around the use of this equipment in residual soils. The LFWD is a surface based, dynamic plate load test that provides quick and direct measurement of a composite insitu modulus parameter of near-surface materials. The direct measurement of modulus by the LFWD negates the need to indirectly estimate the parameter using Dynamic Cone Penetrometers (DCPs) or density testing, both of which have transformation errors associated when “universal” correlations are applied. Due to these advantages the employment of the LFWD is increasing throughout the construction industry for quality control work. It is particularly well suited to optimising the design and verification of construction platforms. The Dynamic Cone Penetrometer (DCP) is a widely used hand tool for near surface ground profiling. 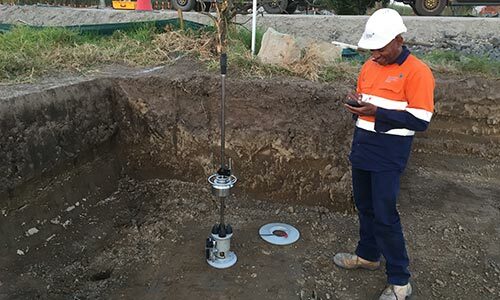 FSG also uses this tool as cost effective method of in situ subgrade, pavement and working platform assessment. In critical areas, FSG also use the PANDA probe for near surface ground profiling. The PANDA has a superior resolution to the DCP in the low strength range. In these circumstances, the improved resolution of the PANDA has potential to offer significant savings in platform or pavement design. FSG is one of the few consultants in Australia who can measure the Standard Penetration Test (SPT) energy. A field SPT N – value measured is useful as a comparative evaluation, but should be corrected for energy when used in design. Most correlations rely on the N60 value and not NField. Any correction (if applied) is based on the international literature, which can vary from 80% to 170% for automatic and trip hammers. Different energy ratios apply for other hammer types. This wide variation in energy correction suggests the need to measure this variable for individual rigs. PDM which has been shown to improve the set – energy measurements of SPTs. FSG carries out energy measurements for other consultants and government bodies to calibrate SPT energy measurements where critical, or where multiple drilling rigs are being used. However, these energy measurements are routinely applied in FSG site investigations where SPTs are used as this is standard practice in USA and Europe, but seldom used in Australia. Without this approach, FSG has found that approximately 20% of soils are incorrectly classified using the field SPT only. Additionally, where multiple drill rigs are used on site the same N – value can vary by up to 50% between drill rigs, when energy corrections are applied. The International Society for Rock Mechanics and the American Society for Testing and Materials have standardized the laboratory procedure for measuring uniaxial compressive rock strength (UCS) and Young’s modulus (E), but these methods can be both time consuming and expensive. The Point Load index (PLI) provides a faster and more cost effective approach to determine UCS. However, while a UCS/PLI ratio of 23 is the most common ratio in the international literature, rock specific correlations need to be established, especially for soft rocks as this ratio may vary from 4 to 40. Rock anisotropy also need to be considered in establishing this relationship. FSG regularly uses this approach to establish rock strength, by using the expanded data set from PLI testing. Correlations from UCS to modulus have also been found to vary widely (from 200 to 500). Balancing the reliability of directly measured UCS and E versus the time and cost benefit of using the PLI must be considered for each project. Establishing Youngs Modulus from the UCS derived from a point load index test has significant variability. To reduce that variability, FSG also uses the PUNDIT (Portable Ultrasonic Non-destructive Digital Indicating Tester) to measure modulus and calibrate rock strength measurements. The Pundit equipment measures both primary and shear wave velocity, which can then be converted to a modulus value. FSG has independently established correlations between the PUNDIT measured velocities and other laboratory-tested properties using rock cores from south east Queensland. The PUNDIT measurement provides a reliable means of determining the small strain modulus, but this represents only an upper bound, and an appropriate modulus degradation factor is required. FSG’s database of various rock types provides this degradation factor. FSG’s expanded approach to rock testing provides improved reliability in the characterisation of rock strength. FSG has developed in house logging procedures which electronically transfer borehole data to design cross section within 24 hours. This is particularly useful when design and site investigation occur in parallel. FSG’s Geo Data management systems help provide project teams with timely ground models which are updated as further data becomes available. Rapid development of ground models is followed by site characterisation for design parameters using local correlations, and appropriate statistical prediction models. FSG also has an in house electronic data base system of geo and pile data (Pile Manager) which can also assist in the planning, design and construction phase of major piling projects.